I was a wife willing to stay and keep my vow, no matter what. I desired a good thing—a godly marriage. Yet I failed when that desire became a demand I placed on my husband who chased the elusive mistress of alcohol. He was locked in the prison of addiction while I was held captive by my pain. If you are waiting for your husband for whatever reason, first of all, your sorrow is legitimate. It is extremely hard. But none of your tears or prayers will be wasted. There is great value in your waiting, praying, hoping, and surrendering. God desires to work in your marriage, but it may begin with you. Ask the Lord for wisdom. For a wife in a difficult circumstance, it's vital that she continually ask the Lord for wisdom. The fog of hurt clouds judgment; seek wise counsel and prayerfully make decisions that align with God's Word. If there is any physical abuse of any kind, get away from the situation immediately and get help! Remember that God is working even when you don't see it. It is impossible with your limited knowledge to see all God is doing to draw your husband to Him. You might not see evidence of conviction for years. That doesn't mean God isn't pursuing him. Remember that God has an eternal perspective. His timetable is not your own. 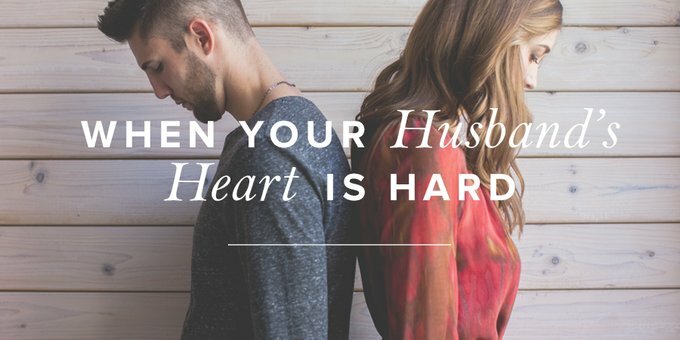 If your husband isn't saved, don't expect him to act like it. You can't believe the kind of movies your husband watches or the language that spews out of his mouth. He doesn't like to go to church and becomes agitated when you bring up anything to do with God. Darkness doesn't like light that exposes sin. If he doesn't have a relationship with Christ, he doesn't have the Holy Spirit to help him discern. His eyes are not open, and his ears do not hear. Pray that the blinders would be removed from his eyes. That doesn't mean you don't stand up to sin. But be respectful of your husband as a person—and of his family. You can hate the sin without disrespecting the sinner. Be cautious with information you share with others. Guard your mouth carefully around everyone, especially your children. Don't allow despair to be your identity. Although your marriage is not what it could be or what you desire, there is still a life to be lived. Your identity should not be found in your struggles no more than it should be in the success of your marriage. First and foremost, you are a daughter of the King of kings. God Almighty has called you His own. No one and nothing can remove you from that, your true identity. Keeping the mindset that you are above all else, a child of the living God, will help you remain eternally focused. To be known as one who suffers is far less gospel-oriented as compared to one who loves and trusts the Lord despite circumstance and suffering. Thinking it isn't fair to have hardship or loss is bad theology and will tilt your perspective of your sovereign God. God hasn't disappointed you; man has! God is the one constant in your life. In all of time, if anything wasn't fair it was piercing the hands and feet of the totally innocent God-man for your vile sins. Repent of your bitterness toward God. Ask Him to give you a right perspective of His love for you. While you don't want to remain in your grief, it is necessary to realize you have been affected deeply by things you could not control. Unpacking those hurts one by one, and then forgiving each one, helps you move forward. It doesn't mean you forgive and forget, but rather you forgive and chose to move on. Remember that God first extended mercy to you by offering His Son on the cross. You were shown mercy and given grace while you were still a sinner. Don't let bitterness take root. The enemy will gladly entice you into believing you deserve returned love. But if you allow those thoughts to consume you, bitterness will destroy you. God is a righteous God, and He will deal with the sin. Even in the times you are called to take a stand, God will ultimately be the One to deal with that person in their disobedience. Be willing to examine your own heart. This is perhaps the most important lesson of all. God wants to do a work in you. He doesn't want to leave you where you are—He loves you too much. He wants to increase your faith, your reliance upon Him, and your love for Him. Be willing to allow God to transform you. In my book, Waiting for His Heart: Lessons from a Wife Who Chose to Stay, my husband's addictions are just the backdrop. The main focus is how God used a long and heartwrenching season to bring me to the point where I desired Him above all else. God loves you. He will never reject you. He hears your cries! He longs to draw you close and fill you with His supernatural peace. No matter what your circumstance, no matter if your situation never changes this side of heaven, God is there. He is the steady hand underneath your days. Which truth above means the most to you in your current situation? Anything else you'd add? If you'd like to hear more of Joy's story, watch the video below. This post was originally posted on the True Woman blog on April 24, 2013. We've refreshed the content in order to allow it to continue to encourage you as God works in your marriage. Through writing, teaching, and speaking, Joy helps women understand their redemptive position in Christ. She has authored the book Waiting on His Heart; Lessons from a Wife Who Chose to Stay. Married to her beloved for over three decades, Joy and her husband are passionate about discipling the wearied and wounded in the context of a farm setting where biblical applications abound. They have four children and five beautiful grandchildren.